I opened the email that the solar installation begins Monday morning! The project we began back in January is finally coming to fruition and I'm SO excited. It's a good thing the support beams for the attic were delivered yesterday. This is the delivery from our local lumber yard. (Funny story about the lumber yard - their phone number is written on the outside of our house - we're talking eye-level as you walk up to the front door. We think hubby's grandfather wrote it there 267-2565 and it won't come off. It's been there for at least 15 years already! Because of that, we decided not erase the smiley face Julien drew below it a few years ago when he entered his Picasso phase.) Seeing as how we now have only the weekend before work starts, I can see hubby will be spending the weekend in the attic sistering up those beams for added support. By the way, local friends, did you notice that our local library had solar panels installed recently? I'll have to ask how that's working out for them! 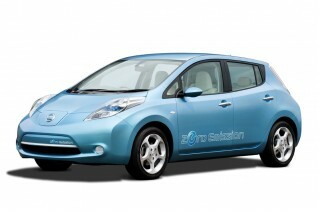 Has anyone else seen the ads for the new eco-friendly Nissan Leaf? Not a hybrid, but fully electric Interesting. Scott's plan is to drive the Corolla until it's no longer possible, then switch to a Prius. For that we'll surely go see my friend Alex at Hoffman Toyota! I suppose we'll have to consider other options as well, and this Nissan means we may have to go for a test drive. Chevrolet also has an option called the Volt, but I can't say I've ever been a fan of Chevy. I'll definitely be doing some research on all of these before we decide, and knowing Corollas, we have a while to figure that out! Just read a GREEN blog today I'd never seen before. It's Australian, so don't be confused when today's article is about spring urban gardening - that whole other side of the equator thing and all. The blog is ecoMILF (Mother Into Fair Living) and I enjoyed it. (That's her banner above.) She was featured on Best Green Blogs and has some really nice articles, vegetarian recipes, and projects. I think we'd have fun sharing a cup of tea and some of that fair trade chocolate she's talking about! Hola Greenie Friends! Happy 1st day of Autumn! 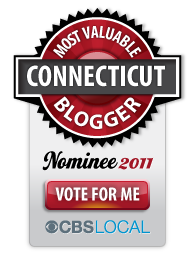 Anyone else get the invite to "Out of this World 2010 the green gala" at the Connecticut Science Center in Hartford? The details: Saturday, Oct. 16th from 7-11pm ages 21 and over. It's an eco-chic evening with food, celebrating the mission of the science center and the first CT gala powered by a hydrogen fuel cell, plus THE GREENIES, awards for various Green fashion statements. Love it. There are also various auctions for some very chic prizes like trips - you know how I love to travel! Sounds like fun, eh? Tickets are $150 pp. Click here for more info. 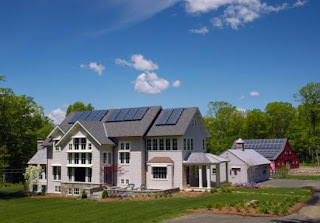 This is the net zero energy home in Killingworth, part of the tour. I think I'll have to make a trek out there! The tour is the same day Scott will be putting up the sister joists to support our roof for the upcoming installation of our solar panels...I wonder if I can tear him away to visit a few homes? Another house on the tour - this one in New Hartford, where I was last weekend. For the full list of tour sites, visit the Connecticut Solar Tour '10 page. 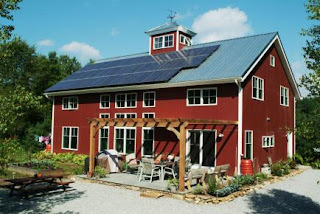 There is also a link on that page for National Solar Tour of the Northeastern United States. I found out about the solar energy tour from Sunlight Solar Energy's Fall Newsletter. It's a great source of information, and there's even a trivia contest that I may spend some time trying to figure out - the prize is a $150 gift card to Patagonia. As I posted on Facebook earlier this week, it's where I learned that the CT Solar Lease Program has just announced that it has funds left for 100 more leases. So if you didn't get your application in back in February, here's your chance! There is also information there about rebate programs for solar thermal (aka ST) and photovoltaic (aka PV) projects. Um hum...we're learning the lingo folks! Hope you have time to get out and enjoy this gorgeous first day of Autumn! We're taking a walk later and heading to the park, but first I have to go dump this bowl of kitchen scraps and coffee grounds in my composter! The truth is that I'm conflicted when it comes to new construction. When it comes down to selling existing homes vs. new, I've always picked existing because it's been the GREENER choice. If we have plenty of housing inventory, then why muck up more of the ridgeline overlooking the lake (just an example from my town) with clearcutting for mcmansions, which not many can afford in this economy? Why ruin the view for the rest of the community? At the same time, I firmly believe people have a right to do what they'd like on their own property, as long as it doesn't conflict with local planning & building codes. I don't deny anyone that right. I've handled this personal dilemma with choosing not to sell subdivisions or seeking out new construction business. Plenty of other realtors are out there who would be thrilled for the business. In my local real estate market, there isn't very much modular or pre-fab construction. I've heard people say that "old yankees prefer stick-built!" Early in my career I met a few builders who were doing it, but there weren't many takers. I read online from the National Association of Home Builders that only 2-3% of homes built today are modular. They say modular building has come so far in the past 30 years or so, and the options these days, are simply fantastic. Especially when you factor in how GREEN you can go with this! 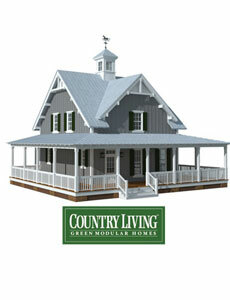 Recently I saw the Country Living Home Green Home pictured above and it stopped me in my tracks. This doesn't look like so many of the modular ranches or colonials I've seen, but more like those sweet HGTV GREEN houses. It's the Hudson model, based on a cottage design: small , full of character and a very nice shade of GREEN :) It's done by New World Home, a company creating sustainable housing with historically inspired designs. Their webpage has a great quote, " We do not inherit the earth from our ancestors. We borrow it from our children." - Ancient Native American Proverb. With such a strong statement/philosophy, it's no surprise the homes built by this company have all achieved the LEED for Homes Platinum certification - wow! I am all about their darling dutch colonial too, called the Dickinson, after Emily Dickinson, which for some reason I can't seem to copy a link for you to see! (Sorry, some days Blogger works better than others!) Visit the New World Homes webpage where you can see this one plus all of the other beautiful homes as well. Looking at modular construction brought me to another website for a company that makes pre-fab outbuildings like sheds, gazebos, cabanas, etc. I found Summerwood Products and their great array of buildings and plans. Their Melbourne garden shed is fantastic and my favorite home studio building is the larger sized Sonoma! Not that I need either...but if you happen to buy/build one let me know! It's nice that you can buy these pre-assembled or pre-cut and build them yourself - less waste when it's done at the factory. 2 other pieces of information to share with you today! Have you heard of or read Jetsongreen.com? It's a blog a million times more advanced than mine written by a team of very hip people. It even lists GREEN jobs available! From the Yale Daily News, which I just started reading since I may be advertising in it shortly: Yale dining plans now include a reusable stainless steel mug for all participants in an effort to be more sustainable and use less paper cups. The dining halls now charge $0.25 for each paper cup, so bring in your mugs. Love the logo on the mug: Yale Where Blue is Green. Reported today, just a few days after the distribution of the mugs, students have complained that the mugs are not spill-proof and are poorly made - whoops! 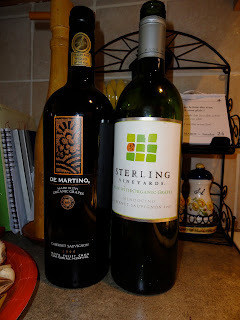 Since this is not an organic wine blog, I'll be brief about the wine I tried last week. 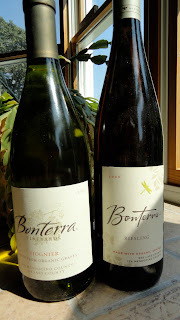 I like some whites, but I have to say I REALLY enjoyed the Bonterra Viognier. So far that's 2 out of 3 bottles I'd buy again! I haven't mentioned our solar panel project in a while, so here's the update. We've been approved and our install date is in October! Seems like it kept getting pushed farther and farther out, but there it is. Scott has some support work to do on the older part of the roof so it will withstand the weight. Since he'll be doing work in the attic we've decided to purge the attic (yet again) and host a tag sale which, when combined with the contents of the garage (we'll be tearing it down next Spring to make way for one which will be less critter-infested and might actually fit our cars,) and the goodies in the basement, should be quite the interesting assortment. Connecticut Light & Power, our electric company has already sent us the emails regarding whether or not we'll require a separate transformer, etc. I just can't wait to start generating! My 4 year old just asked, "What have we done that's environmentally-friendly this week?" Let's see: walk to school, ride bikes to school, carpool, compost, recycle, eat all organic veggies, harvested fruit at a local orchard, Mommy drank organic wine, plus the ususal stuff - overall a pretty GREEN week. I'd write more but I'm knee-deep in real estate negotiations, planning to put 4 more houses on the market by the end of the month, and preparing for 6 appointments tomorrow. My introduction to organic wines continues! Last week I drank a Sterling Vineyards 2007 Cabernet Sauvignon, which was fruity as promised, but a little less full-bodied than I prefer. It grew on me after a few sips, and I think it grew on hubby as well, because I think he finished the bottle on me! The De Martino Cab - wow. The label was right on with the full-bodied and long lasting finish. Yum. I'll be drinking more of that. I thought this would be the week to try out my first biodynamic wine (at least that I'm aware of - it's entirely possible I've had some from French friends who drink organic.) Turns out it's kind of hard to find in my little town. Maybe it's because I didn't find the word "biodynamic" on any of the labels. I suppose I need to go into the store armed with the names of the labels I'm looking to try. 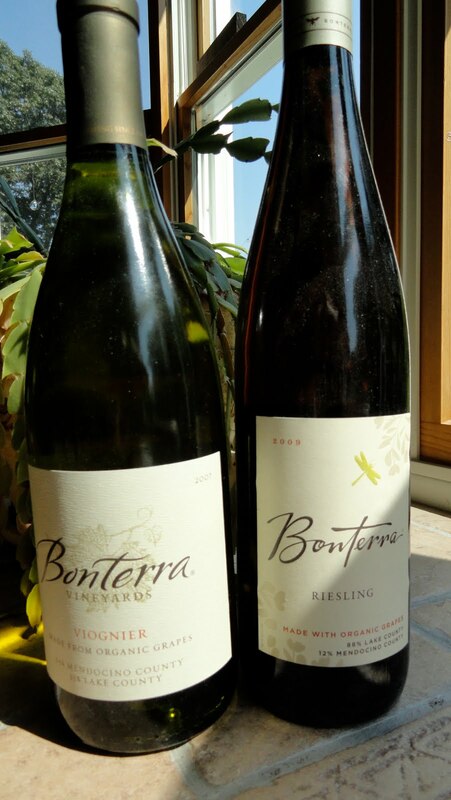 Two bottles of Bonterra Vineyards organic wines did make it home with me for the next 2 tastings: a 2007 Viognier & a 2009 Riesling. Once in a while I give a Riesling a try, and with the heat we've had lately, it just seemed appropriate. 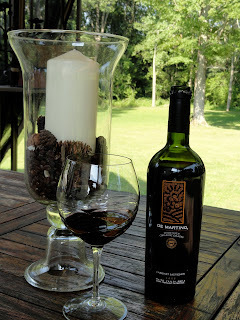 Bonterra Vineyards also has a biodynamic label - The McNab, which is comprised of Cabernet Sauvignon, Petite Sirah & Merlot. They even have a Facebook page. I'll be on the hunt for another biodynamic wine from Dry Creek Valley in Sonoma. Quivira Wine supposedly makes excellent sauvignon blanc (yay!) zinfandel & rosé. I'm also planning to try something from Grgich Hills, who earns an extra GREENIE point (you know, like a brownie point?) for running on solar energy! I'm loving their website. My Viognier is chilling in the fridge for later! I'll see if my favorite organic-minded neighbor would like to sample it with me :) I picked up a fabulous little book called green chic SAVING THE EARTH in style by Christie Matheson. She begins it with a quote from Saint-Exupery's Little Prince, "It's a question of discipline, " the little prince told me later on. "When you're finished washing and dressing each morning, you must tend your planet." Cheers to that!